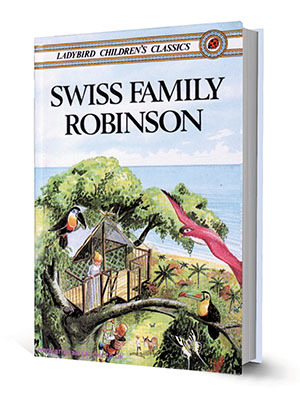 One of my earliest, most soothing literary memories doesn’t involve the written word: It is a couple of drawings from a Ladybird Children’s Classics edition of Johann Wyss’s 1812 novel Swiss Family Robinson. The story had a family shipwrecked on an island where it proceeds to use available resources as best as it can, and the pictures that most enchanted me were of a cave-house dug into a cliff, to spend the winter in. The interior was cosy, warm and well-lit, the doors and windows were rounded, there were little bookshelves, and the rooms in which the children lounged on bunks seemed to belong to a particularly luxurious boarding-school hostel. Even the stalactites hanging from the cave’s roof seemed friendly. The cave-house images changed the tone of the book. They seemed to say: Even on a strange island, you can find your personal castle. By this point in the story, the Family Robinson is well-settled in its new surroundings—in control, with much of the danger having past. There are many other comforting houses in children’s literature: In Enid Blyton’s Faraway Tree series, Moon-Face’s house—located near the top of the tree, and containing a slide that takes you back to the bottom—becomes a meeting point for the characters before their adventures begin. But such settings can be deceptive too: In Hansel and Gretel, the children are lured into a witch’s captivity because they are so mesmerised by her house, made of cake and chocolate. And in CS Lewis’s The Lion, the Witch and the Wardrobe, four children living together in an old country house discover, in the wardrobe, a portal to the magical land of Narnia. Given that the story was set during the Second World War, the escapist implications are obvious. Yet there is also the knowledge that the real-world house is a place that must be returned to: You can’t stay in fantasy-land forever. Anglophone literature of an earlier vintage was often set in a world of ancestral estates or mansions that a family might have stayed in for centuries. Hence the many books that are named for residences—such as Jane Austen’s Northanger Abbey—or otherwise feature houses that are vital to the story: Pemberley in Austen’s Pride and Prejudice, where the relationship between Elizabeth and Mr Darcy—dislike slowly turning to love—develops; or Mrs Havisham’s frozen-in-time mansion Satis House in Charles Dickens’s Great Expectations, mouldy and in disuse, its appearance echoing the heartbreak and festering bitterness of its owner. And try imagining PG Wodehouse’s delightful Blandings Castle books without the setting: An English country estate where improbable things happen, imposters hop in and out, stern aunts get their comeuppance, lovers are reunited—and all the while, the absent-minded Lord Emsworth, king of this particular castle, is only concerned with his beloved pig the Empress. When Evelyn Waugh called Blandings a Garden of Eden, it was recognition that such a setting was more like a state of mind than an actual, physical space. Houses don’t have to be welcoming places, of course, as evinced by the mystery and horror genres. “Last night I dreamt I went to Manderlay again” is the famous opening sentence of Daphne du Maurier’s Rebecca, told in the voice of an unnamed young woman who marries a wealthy man named Maxim de Winter, goes to live in his estate as a happy young bride, but finds herself in the shadow of Maxim’s deceased first wife Rebecca. Every corner of the house—being haunted by Rebecca’s memory—becomes overpowering for the young narrator. Other modern haunted-house novels include Stephen King’s The Shining (in which a writer named Jack Torrance takes up a position as the off-season caretaker of the Overlook Hotel one chilly winter, and finds the hotel exerting a strange spell on him) and Shirley Jackson’s The Haunting of Hill House, about experiments in fear conducted by a Dr Montague and his subjects. The accent in these books is on psychological horror, the house becoming a conduit for the demons in the characters’ minds. But there has also been a tradition of outright supernatural terror in Gothic houses, such as the vampire’s castle in Bram Stoker’s gripping Dracula (with one of its creepiest images—Jonathan Harker held captive in the ancient house and watching from a window as Count Dracula crawls, spider-like, down a wall). Many “house” books have supplied commentary on class relations and how they affect human behaviour. Kate Summerscale’s The Suspicions of Mr Whicher is an account of a real-life crime—the murder of an infant boy in an English country house in 1860—but one of its subtexts is the complicated set of relationships between the “masters” and the “servants” living in Road Hill House (a maid moves up the ranks when she becomes the second wife of the house’s owner, leading to resentment among other family members). A famous novel written a decade before the Road Hill murder, Charlotte Bronte’s Wuthering Heights, is about the upward mobility of wild child Heathcliff, and what the farmhouse ‘Wuthering Heights’ represents to him—a place of aspiration but also deep loss. And one of the most distinctive house-centred novels I have read, Sarah Waters’s The Little Stranger, is an atmospheric ghost story, but is also about the blurring of class lines in post-WWII Britain, and the effect this has—materially and psychologically—on the old rich and their one-time servants. Speaking of, "Enid Blyton's Faraway Tree series," I am glad to inform you that I discuss, via comparison and contrast, key salient aspects found in The Magic Faraway Tree series with some of those found in the Famous Five series in my book on Enid Blyton, titled, The Famous Five: A Personal Anecdotage (www.thefamousfiveapersonalanecdotage.blogspot.com).